Down a quiet side street near the bus station, Poonsook offers exceptional value for spacious, clean and comfortable rooms. Average rating 7.6 from 454 reviews. Though lacking character, the rooms have good quality beds on white tile floors, air-con, TVs with several English channels, desks, mini-fridges, tiny balconies and extra-large bathrooms with partitioned showers. A lift is provided in the fairly large hotel, which is fronted by a parking lot. In the lobby you’ll find a detailed map with some good info on exploring the area. The location is a bit removed from downtown, but it’s only a 10-minute walk to the night market and you can always catch a city bus, taxi, tuk tuk or motorbike taxi at the bus station, which is just around the corner. Minimal English is spoken but the receptionists are friendly. To get here from the bus station, walk to your left towards the main road and keep left into Soi Thip Saena, marked by a blue sign, and you’ll see Poonsook after around 100 metres on the left. Note that room rates on the hotel’s Thai-only website are more than double what we paid as walk-ins in September ’14 (rates on Agoda were a smidge higher). Further up Highway 12 from the bus station, Rattana View Hotel and its sister, Rattana Park, offer comparable rooms with a few more extras for another few hundred baht. 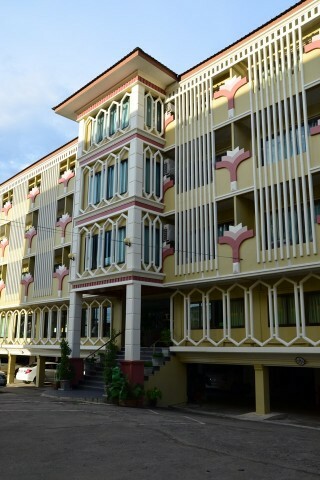 Check rates at Poonsook Resident Hotel on Booking.com.